Base mixes are the fundamental components for all types of ice cream, gelato, sorbet, or soft-serve. The base mix gives you the necessary ingredients to obtain the proper texture, structure, freezing and melting point, as well as consistency when creating your frozen desserts. 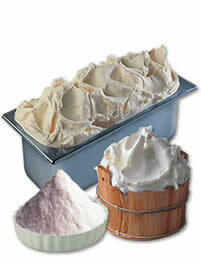 Gelatodream has developed a variety of base mixes for all kind of recipes and production methods. Our base mixes range from a concentrated formula to a complete pre-measured and ready-to-use solution. Our mixes can be used in all kinf of production facility : gelato shop, ice cream factory , yogurt parlor , hotel , restaurant , pastry and bakery stores . Perfect companions of a Base Mix are the Gelatodream Milk , Fruit or Yogurt Flavor. We have hundreds of different recipes : check our blog at Gelato Community !